Wanted a full power 5W UHF Handheld CB, but didn't want to spend too much - but wanted something better than the cheapest CB brands available here, that also tend to look a bit plasticky? Didn't want a 1-2W toy either. The AUSCB may well be for you. Comes with Radio, Battery Pack, Antenna, Belt Clip, Charging Dock, Wall Charger to suit Charging Dock, and a simple and easy to understand manual. 12 Months Warranty on radio from defects in materials or workmanship from date of purchase. Power On Voltage Indicator: When turning on the radio, the LCD screen will briefly indicate the battery's voltage. Automatic Battery Save: The automatic battery save is one of the best in the business. You wont even notice it, but you can get up to 30 hours of receive time, depending on how the radio is used. Traffic Controllers tell us that they get all day out of the battery, even when doing 12hr shifts. VOX: Voice Activated Operation works when an external microphone is used, like a speaker-mike, for hands free operation. VOX function is accessible through the keypad. Quick channel access by numbered keypad - unlike most Australian handheld CB's that only have scroll buttons for up and down channels. Receiver sensitivity: 0.20uV @ 12dB SINAD (-121dBm). In layman's terms that means really good, better than standard (to give an example - Crystal handhelds have a sensitivity of 0.35uV, Digitech & Oricom 0.28uV, and Icom a 0.25uV [standard]). What grabs most peoples attention when they first get the AUSCB Radio is how solid the radio feels in their hands and the build quality. 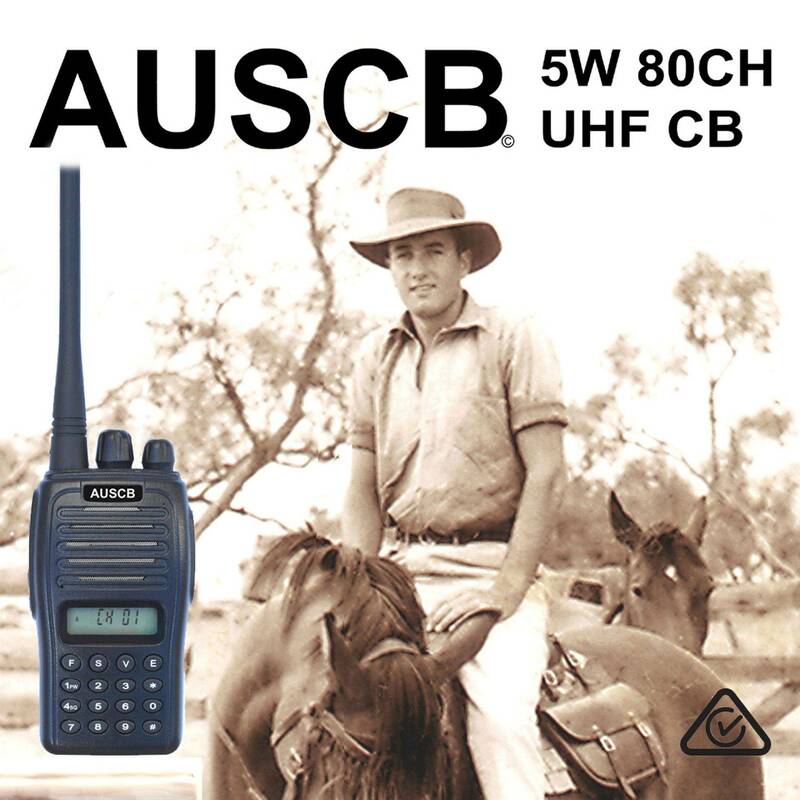 The AUSCB Radio is supported by a full length Aluminium Chassis. The AUSCB is also type approved to the Land Mobile Service (licensed private or commercial frequencies) covering 450-520Mhz, which means it has to be held to a higher technical standard than the average CB.